← Summer in the City. Breakfast Smoothies with Fresh Fruit and Greek Yoghurt. The countdown is on to the end of the school term. Three days to go before the long summer holidays begin. This weekend was my last chance to get all those little end of year gifts organised. 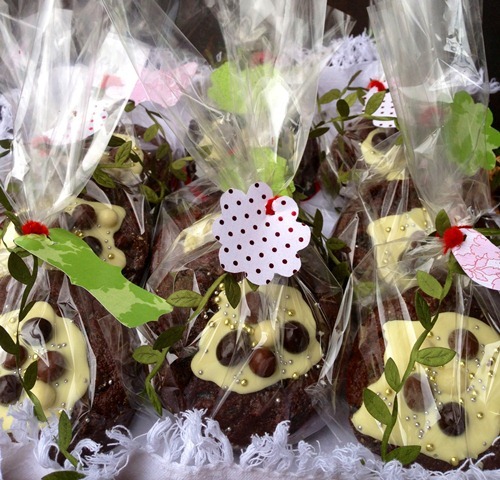 Somehow, despite the heat, a full schedule of sport commitments and a couple of cocktail parties thrown in for good measure I managed to find time to bake, decorate and wrap these gorgeous little chocolate fruitcakes. What a relief. Another item ticked off my burgeoning to-do list. Thank you Nigella Lawson for your divine Chocolate Fruitcake recipe. Its to die for. An elegant but refined version of that old fashioned stalwart – the classic boiled fruitcake. A melting pot of Christmas textures and flavours. Prunes, cocoa, oranges and coffee flavoured liqueur produce a lush and almost pudding like cake. I stumbled across it a few years ago and was immediately attracted to its simplicity. Needless to say with some idiosyncratic tweaking this has become my Christmas staple. The recipe is infinitely adaptable. From large and substantial Christmas Day centrepieces to individual pudding sized gifts. It’s secret is in the boiling of the dried fruits before baking. Boil and bake. That’s all I had to do. Not too onerous at all. To cut the baking time in half I used cute little mini spring form cake pans. And for the decoration? Melted white chocolate. Dolloped artfully into the centre of the little cakes. Chocolate covered coffee beans and gold and silver cachous. Strewn casually on top. Wrapped in cellophane. Tied with ribbon and a gift tag. Pretty to behold. Rich, luscious and delicious. If making a gluten free version of this cake substitute the flour for an additional 1 1/2 cups of ground almonds. Without the flour the cake lacks a little structure but firms up beautifully when refrigerated. 1 cup (150 grams) flour or substitute another 1 1/2 cups ground almonds for the flour if making a gluten free version. GREASE and line one 25 cm round spring-form baking tin or eight 12 cm round mini spring form baking tins. PLACE the fruit, butter, sugar, honey, coffee liqueur, orange zest and juice, mixed spice and cocoa into a large wide saucepan. HEAT the mixture until it reaches a gentle boil, stirring the mixture as the butter melts. Let the mixture simmer for 10 minutes. REMOVE the saucepan from the heat and leave to stand for 30 minutes. CAREFULLY pour the fruitcake mixture into the prepared cake tin(s). Transfer the cake tin to the oven and bake for 1 1/2 to 2 hours for the large cake or 45 minutes for the mini fruitcakes. The top of the cake should be firm but will have a shiny and sticky look. At this point, if you insert a skewer into the middle of the cake, it will still be a little uncooked in the middle. PLACE the cake in its tin on a cooling rack. Once the cake has cooled completely, remove it from the tin. MELT the white chocolate and dollop into the centre of the cake. 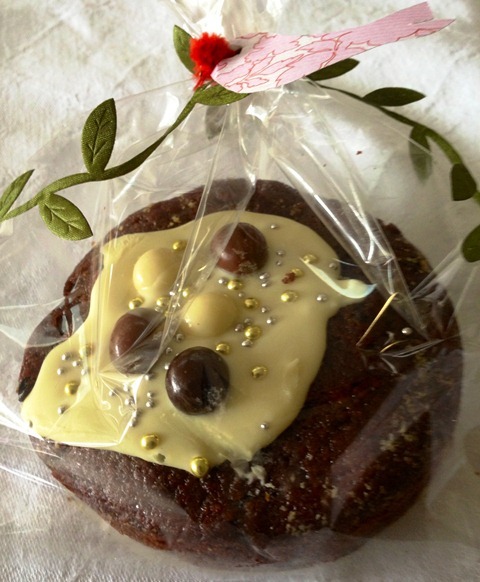 TOP with chocolate-covered coffee beans in the centre of the cake and a sprinkling of gold and silver cachous. WRAP in cellophane bags and tie with ribbon and a pretty tag if using as gifts. This entry was posted in Baked, Chocolate, Sweet Treats, What I Love to Cook and tagged Almond Meal, Baking, Chocolate, Cranberries, Food, Gluten free, Kahlua, Orange, Prunes. Bookmark the permalink.